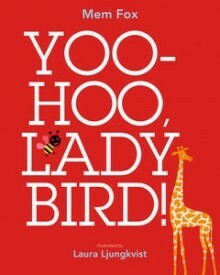 I just LOVE LOVE LOVE this book!! Where to start? Yes, it is very simple for little people with a rollicking rhythmic text that just begs to be read aloud accompanied by some stomping feet. A young dinosaur progressively gets grubbier and grubbier until finally he decides it is time to have a bath in the local swamp. Janeen Brian has created a perfectly balanced rhyming text that is matched by an onomatopoeic refrain for each action creatively executed in bright primary colours. I’m a dirty dinosaur with a dirty tail. I flick it in the muck or I slide it like a snail. 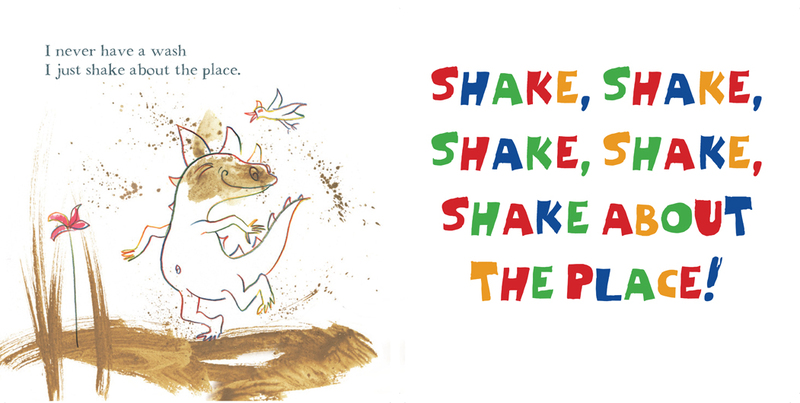 The superlative Ann James, who never fails to produce outstanding artwork, has matched this dinosaur tail…oops, tale…with illustrations in magic pencil, watercolour and mud – yes, mud! The little dinosaur is seemingly simply outlined in rainbow magic pencil which echoes the colourful font of the refrain and with each illustration more mud is added to his blank canvas to match the text. Another detail about the book that has real appeal is the very sturdy cover with rounded corners – most suitable for small hands. If you haven’t already grabbed this book, make sure it is on your list pronto – I know I can’t wait to share it as a bedtime romp at my place. Check out Ann James talking about her creative process here at Penguin, and at My Little Bookcase, an idea for muddy paintings. Highly recommended for any little dinosaur lovers from 2 years up. 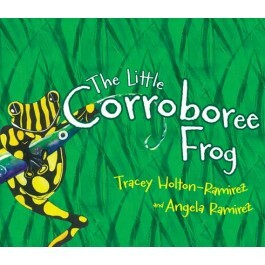 When I was living and teaching in Canberra, we had a very engaging Unit of Inquiry for the Year 1s to begin their research skills and report writing based around the Corroboree Frog. Until that point I was pretty much unaware of these gorgeous little animals and their very precarious grip on survival but soon became quite intrigued. I remained disappointed not to have seen a real one but have discovered much information about them. One of the problems with delivering the unit was that there was very little material written for younger students. This little book while written as fiction contains a wealth of information and is presented at a very accessible level for Lower Primary children. 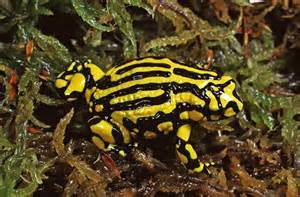 Jet the corroboree frog is anxious about his family’s eggs being threatened despite all his efforts to tend the tadpole ponds. When he seeks advice from Grandmother Frog he realises the dangers that are undermining the survival of his species – particularly those caused by humans. A little boy and his father who happen to be visiting his region to go fishing in the nearby river present the perfect chance for Jet to initiate some change in human thinking and action. This is a really simply written ecological tale and achieves its goal without being ‘preachy’. A lovely double page spread at the end gives readers lots of facts and figures as well as links for further investigation. Very much worth inclusion on your shelves and a book to share with all little people who love animals of all kinds, even teeny little clammy ones. Postscript: October 2014 Congratulations Tracy, Angela and Magabala on the Whitley Award from the Royal Zoological Society of NSW! You only have to look at these little guys in real life to see why Norma MacDonald chose to make one the main character of this lovely picture book! Click on the picture to see a film clip. Cheeky is a truly delightful little character and one that young children will relate to easily. With just enough bravado and just enough danger to make this a very realistic story – and lesson- for little ones, it strikes exactly the right note. Set in the Pilbara, Cheeky finds that showing off in front of a big snake is NOT a very good idea at all! Luckily for him, another of his potential predators saves his tail and Cheeky is a little more subdued when he returns home safely to his nest. I love that this is a very authentic Australia picture book, featuring our own native fauna as the stars of a story without being contrived or reworked from other sources. 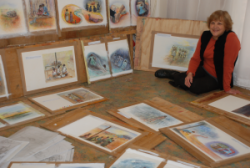 Norma MacDonald is a renowned artist who is also the author of Stolen Girl, a fictionalised picture book story about the Stolen Generation. Giddyup for Saddle Club ! Yes, just when you thought you were safe from frenzied whinnying, head tossing and ponytail flicking from the little horse-mad girls in your library, along comes a whole saddlebag full of new Saddle Club adventures. Attractively presented with very contemporary covers and two complete stories in each volume, these will no doubt be trotting – or even cantering- off your shelves in short order as soon as they are spotted. Carole, Lisa and Stevie are the Saddle Club members, their friendship forged by bonds of their shared love of horses and riding together at Pine Hollow Stables. Their adventures in these volumes include their first rodeo, holidays spent apart but with individual excitements such as Carole’s Christmas present bay gelding Starlight, a new Pony Club at the stables, visits from an Italian riding team and loads more. Perhaps not the most highbrow of reading but enjoyed endlessly by all those girls who long to have their very own horse as well as those who are lucky enough to already own one, over the years I have seen this series borrowed over and over again. We all need our ‘chill time’ when we can pick up what I refer to as ‘lolly’ books and just read without having to think too deeply. This little ladybird loves to hide and finding just where she is hiding will delight young readers immensely. And older readers who adore great end papers will also love it! Whether she is ‘stuck on the stairs with a couple of bears’ or ‘outside the house with Chicken and Mouse’ little people will have great fun searching for this happy little bug amid some gorgeously vibrant illustrations. I spy for toddlers – with rhythmic rhyming text that is perfect as a read-aloud – highly recommended for small ones 2 years and up. How could I resist this novel from our own local Redcliffe boy, William (brag note: with whom I have had the pleasure of conversation on more than one occasion!) – especially when narrated by Himself. After delighting readers with his uproarious first book of memoirs A Man’s Got to have a Hobby, William published this novel to similar great acclaim. His writing career continues to attract a loyal and enthusiastic fan base. The Yarraville Fourths are a suburban cricket team comprised of mostly middle-aged men of dubious skills, none of whom would ever have been considered as a contender to wear the baggy green. However, there is much more than just neighbourhood cricket going on in this hugely funny book. Chris Andersen is really the Everyman figure and his team of assorted characters range from Brian, the intellectually impaired young man to Livey, the constantly farting local butcher – and each one has his own story to bring to the Cec Bull Oval. Connecting past and present, the local oval is like a hub in the wheel of life in this typical suburban locality. Although, on the one level a very humorous book about an often dysfunctional team, McInnes takes the reader on a journey of exploring much deeper themes and concepts mostly through the eyes of the gentle and kind hero, Chris. Definitely was gravitating towards humour in the last few audio selections and this was a superb choice – the kind that had me sitting in the car at my various destinations just to listen to a little more, and no doubt, passing motorists thinking I am somewhat challenged, driving along laughing aloud for no apparent reason. Martin Carter is having a serious mid-life crisis day. The manager of a small town bank, married to a cheating bitchy wife with two decidedly unlikeable stepchildren, Martin turns fifty and not a single person remembers his birthday. 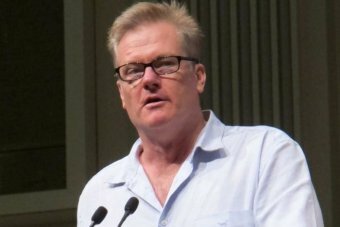 As it happens, he is also losing his job as his little local bank exists primarily to handle the wages of the local meatworks, now being closed down. Faced with an overwhelming sense of depression and failure, Martin makes a snap decision that shakes him out of his torpor with a vengeance – he robs his own bank. With $1 000 000 stowed in garbage bags and no real plan, Martin takes off on an extraordinary, and hilarious, road trip – meeting the enigmatic and delightful Faith (a librarian, no less! ), becoming embroiled with bikies both dead and alive, getting caught up in a spy scandal of deadly proportions, meeting a millionaire mogul and more – to find his way to an old schoolmate’s place in Far North Qld – and that’s when the action really begins! Quite interesting and gently humorous, though not riveting, Thorne explores 100 slang terms that define the Englishness of the English. Sometimes intensified by the addition of ‘utterly’, ‘totally’, ‘completely’ or ‘absolutely’, barking means abjectly, visibly and audibly – and the implication is hopelessly, on a long-term basis – deranged: possessed of an aggressive rather than a passive craziness. Among hundreds of examples of barkingness gleefully printed by the tabloids since the 1980s have been King George III, a £32, 000 lottery grant to teach the homeless to growl (“Phil Minton …uses the cash to create so-called ‘feral choirs’ of tramps keen to ‘find their inner voices’”) and a bride whose wedding train was carried by pug dogs instead of bridesmaids. In my last couple of schools I had purchased a very attractive and informative picture book called My Librarian is a Camel by Margriet Ruurs – a photo essay of unusual mobile libraries around the world and thus was immediately drawn by the title of this novel. This novel looks at such a library service in Kenya, staffed by a rather grumpy local librarian and Fiona (Fee) Sweeney who has taken leave from her New York library to bring literature, culture and enlightenment to remote communities. Although her intentions are completely well intended and her passion genuine, Fee is unprepared for the difficulties that this project brings, especially to one little nomadic settlement called Mididima. Conflicting views on the presence of the book mobile along with a clash of traditional and more modern values, complex relationships all contrive to create a situation of great tension within the community. The ending is quite haunting and I was left feeling a little depressed I think but it was certainly a compelling and well told story. My only complaint was that I did not care for the choice of narrator. 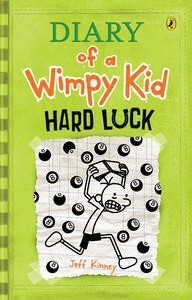 I have no doubt that there were some furtive sidelong glances from my fellow commuters yesterday on the train as I chuckled my way through the latest of the Diary of a Wimpy Kid books – Hard Luck. There is something about the hapless Greg Heffley that strikes a chord with thousands of fans, including me (perhaps because he sometimes puts me in mind of Frank Spencer, Some Mothers Do ‘Ave ‘Em). In this latest episode from the continuing comedy that is Greg’s life, our poor anti-hero finds himself without his lifelong friend Rowley because – shock! Rowley has a girlfriend with whom he is totally besotted. No one to carry his heavy bag of books, no one to give out dog poo warnings, no one to deflect the feral forest thugs and certainly no one to hang out with. Greg discovers that making new friends in middle school is a difficult if not impossible ask. 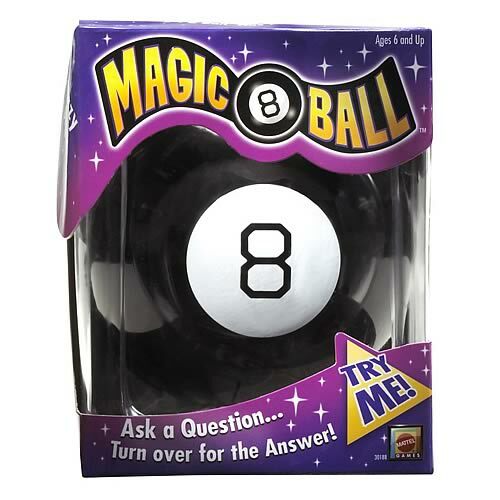 Fed up with what he sees as wrong decisions being made about his life and the subsequent disastrous consequences, Greg takes fate in a firm grip and starts placing all his choices with the answer given by a ‘Magic 8’ ball. Naturally, this does not go according to plan! Amongst many hilarious scenes from the book, my undoubted favourite is Greg hiding out in his mother’s wardrobe and uncovering a ‘secret stash’ hidden away – no, not what you might think at all! This carefully hoarded cache is a collection of parenting books, from which Greg recognises many techniques used by his mum along with multiples of his favourite toy – in case of disaster with the original (or is that no longer the original?). Released with judicious timing to land in Christmas stockings around the country, this one is highly recommended for readers, both boys and girls, 10 and up – and as with all the Wimpy Kid books, a great choice for reluctant readers. ü He still doesn’t have to shave too often. ü His first decent drawing was of a turtle at the age of 3 (Jeff, not the turtle). ü He created the kids’ website Poptropica.com. ü His favourite computer games are the Mario Kart series. ü His favourite sandwich is peanut butter and jelly (eeeuw). ü His favourite song is ‘Brownville Girl’ by Bob Dylan. ü He has two brothers and a sister. ü At one stage he studied to become a federal law enforcement officer. Confession time – I have only ever read the first Percy Jackson book (Percy Jackson and the Lightning Thief 2005) but in my defense, I hasten to add because the subsequent titles were NEVER on my library shelves long enough! Even when a new arrival came into the office, there was always some poor deprived student hovering waiting on some speed processing so they could borrow and devour the next installment. More than 20 million copies have been sold in more than 38 countries with two film adaptations to date – figures which attest to the huge popularity of the initial and subsequent series. In this latest adventure of the intrepid and dauntless demi-gods, Percy and his girlfriend Annabeth are trapped trekking through the Underworld, pandemonium reigns in the form of an escalating feud between the Greek and Roman versions of the immortals and most dire of all, the earth is under threat from Gaia (Earth) the most ancient, powerful and malignant goddess of all. As Percy (son of Poseidon, for those who don’t know) and Annabeth (daughter of Athena) combat monsters and dark forces, the rest of the band of seven are struggling with their part of the fateful mission to save the world. They are Leo (son of Hephaestus), Frank (son of Mars), Piper (daughter of Aphrodite), Hazel (daughter of Pluto) and Jason (son of Jupiter) and each brings to the band of comrades their own special attributes or demi-god powers. 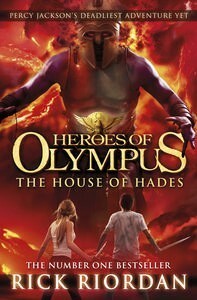 The wonderful juxtaposition of teenager/demi-god is one of the most significant devices in the books. As normal as teenagers can be with their anguish over boy/girl relationships, being popular and so on, these teenagers deal with a rigid definition of their own half-blood heritage. Moments of humour break the tension and the whole plot is believably and proficiently executed as time races away and the band of semi-divine warriors each face their own demons. Devotees will have already scoffed this up upon release but definitely worthy of a place on the shelves for readers 12 and up. 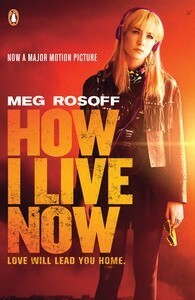 Meg Rosoff’s debut novel, first published in 2004 was the winner of the Guardian Children’s Fiction Prize and received great acclaim from all quarters. After finally reading this powerful novel, re-issued to coincide with the film released in October this year, I can wholeheartedly concur. From the very first few pages I was hooked into Daisy’s story and indeed read the entire book in a single morning and afternoon commute. Daisy is a fifteen year old New Yorker with an indifferent father who is besotted by his pregnant second wife, also known as Davina the Diabolical. Daisy’s mother died giving birth to her and throughout the book there is an overwhelming sense of the vacuum this has caused in Daisy’s psyche. To spite her father, Daisy makes a choice to go and live with her English cousins and aunt, the sister of her late mother, and it is as she initially meets with this very charming but definitely different family, that we begin to read between the lines and learn that Daisy has brought some serious emotional baggage along with her including anorexia and self-harming. Aunt Penn although briefly appearing, represents Daisy’s absent mother figure and her cousins Osbert, twins Edmund and Isaac and Piper quickly become a vital part of Daisy’s sense of belonging. In particular, she is drawn immediately to 14 year old Edmund and upon realising the attraction is reciprocal a very deep and passionate physical relationship begins between the two. The backdrop of a looming war with an unspecified enemy moves quickly to the forefront of the plot and when Aunt Penn is stranded in Oslo on a peace mission, and the invasion escalates the children are left to fend for themselves. The ensuing trauma endured by all of them, including painful separations, survival under the most adverse of conditions, witnessing horrific brutalities and more changes their lives forever. With echoes of the Holocaust resonating throughout the scenes of war, the family torn apart are finally reunited but with inescapable permanent consequences. A fabulous read for mature readers from Lower Secondary up. Outgoing inaugural Australian Children’s Laureate Alison Lester began her present career with children’s book illustrations in 1979. In 1985 her first book in her own right, ‘Clive Eats Alligators’ was published and since then dozens of books have followed from simple picture books to novels. Her seemingly boundless talents have now produced a beautiful ‘part lullaby, part poem’ celebrating the world from a small baby’s perspective. I would also describe it as ‘part prayer’ as the warmth of the one who loves the baby washes over the whole text. and splash in the ocean. 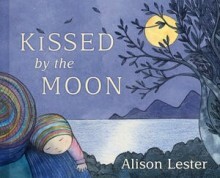 The beautiful cover and endpapers reflect the night time using shades of indigo and grey while the illustrations themselves are a joyous revelation of all the beauty of new experiences for a growing babe – the garden with its creatures (a particularly gorgeous illustration), the bush, rain, sunshine or snow and more. Some wonderful double page spreads are interspersed between smaller ‘snapshots’ – all with the inimitable Alison Lester style and grace. Another book that would make the perfect ‘welcome’ gift for a new little human in your world, this is also a delightful read aloud for little people from around 2-4 years old.